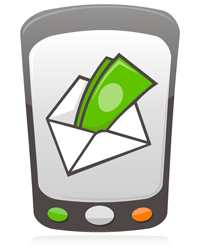 Bank of America Merrill Lynch, Fiserv roll out products allowing companies to pay consumers via email, cell phone. For years, consumers have been able to send payments electronically to friends or family members via an email address or cell phone number. Now companies are starting to catch up. Last month, Bank of America Merrill Lynch rolled out a product called Digital Disbursements that lets companies substitute such payments for checks, and Fiserv announced a business version of its person-to-person payment product, Popmoney.